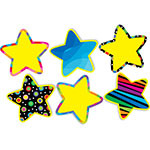 Schoodoodle.com has large classroom accents for classroom bulletin board sets and the general school supplies teachers need to decorate their classrooms. SchooDoodle also sells bulletin board paper, bulletin board punchout letters, and subject-specific bulletin board sets for early childhood, language arts, math, science, social studies, and foreign language. Shop our selection of coordinating mini-cutouts!